Are you a federal employee or military personnel looking for an easy way to give to CDR? 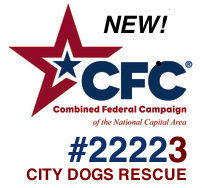 Make a tax-deductible contribution by selecting City Dogs Rescue on your Combined Federal Campaign (#22223). Pledges to CDR made by federal civilian, postal and military donors during the campaign season (September 1st to January 15th) will pay for medical care, shelter fees, transportation, and other operating expenses. Payroll deductions will start in January 2014 and are tax-deductible. If you are not a federal employee but would still like to make automatic monthly donations to CDR, please click HERE. Thank you for your support! If you would like to help us spread the word about City Dog Rescue's participation in CFC, please join our CFC Facebook Group. Please email us if you have any questions about the CFC.